commitment to making our city a better place today and for the future. This may include life-long service, outstanding acts of kindness, inspiring charitable work, community building or any other exemplary achievements.” Anyone acquainted with Lynne knows she qualifies in every way. 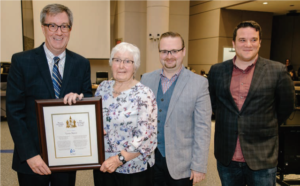 In his remarks at the award ceremony Mayor Watson recognized Lynne’s extraordinary contribution to the City and noted that, in 2007, Lynne received the Governor General’s Caring Canadian Award. Many of your will have come across Lynne at the Navan Curling Club. She and husband, Frank, are founding members of the Club. Lynne was convener for Monday and Tuesday day curling for many, many years and is still an active member. Anyone who has had the pleasure of curling with her will know that this lady puts her heart into whatever she does. She brings an infectious zest, enthusiasm and joie de vivre to all her activities. Her volunteer “curriculum vitae” is lengthy, far too long to include here in its entirety. A few examples will have to suffice. For 40 years she has been a Girl Guide leader and the pianist at Queenswood United Church. In 1992 she organized the Cumberland Community Singers and is still acting as the group’s manager. She is also still Manager and Treasurer of the Cross Town Youth Chorus, a group she started almost 20 years ago. She started Orléans Choirfest 33 years ago and is still organizing it. For the past 20 years she has organized visits to seniors residences by the Cumberland Sunshine Singers. from La Cité in the Pool Program. In her “spare time”, Lynne has also operated a safe home for 15 years for youth who have run away from home, hosted families for Adventure and Citizenship for the Ottawa Rotary Club for the last 33, been a Cancer and Heart & Stroke convenor for 25 years, and been an active Legion member for 11years. Congratulations, Lynne, on this well-deserved honour. You set a wonderful example for all of us.